What e-mail provider do developers use? As does happen from time to time, I got an e-mail today where everyone on a list’s e-mail address was visible, rather than being BCC’d. I don’t want to beat the company up about it, because it’s an unfortunate fact of life that that kind of thing does occasionally happen due to simple human error, and they sent out an apology straight away. Anyway, the interesting thing about this mail was that it was to developers who scrobble music to last.fm. That means it is not a general public sort of list – typically one person from each organization what has some software which can scrobble, and also most importantly, these are very technical people who are almost certainly all computer experts, who’s opinions on technical things are probably quite illuminating. Now, normally I wouldn’t have looked twice at the actual addresses, but they had actually put them in the body of the e-mail, so I had no choice but to scroll through them all to get to the text. 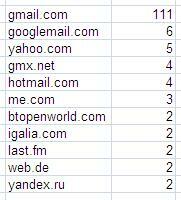 What struck me about this list of 312 e-mail addresses was there seemed to be quite a lot of gmail addresses. So many that I decided to do some analysis. What I discovered was that 117 e-mail addresses were gmail or goolemail. That’s 37% of developers using google for their e-mail. The next highest was yahoo at 1.6%. That’s quite a commanding lead for google. Now, I use Google Apps for my e-mail, so although my e-mail address is at milliesoft.co.uk, my mail is actually handled by Google. I wondered how many of the rest of the developers fell in to that category, so there was only one thing for it. I wrote a script to do a lookup on the MX record for each domain to see who actually ran e-mail for the rest of the addresses. The findings were that 47 domains in the list are actually google apps domains. That means that for my sample of developers, we have the following e-mail providers (anyone with <1% share is on the “Others” box). More than half? of? the developers use Google as their e-mail provider – nearly 30 times more than the next contender, Yahoo. According to wikipedia, gmail has 146 million users, hotmail has 343 million, and yahoo mail has 266 million users, so developers certainly buck that trend.